Description: Previously unreleased, historic live recording! The Jazz At The Concertgebouw Series is a stunning discovery! For the first time ever, we get to listen to a series of live concert recordings of top American jazz musicians, made at the world-famous Concertgebouw in Amsterdam in the late 1950s and early 1960s! 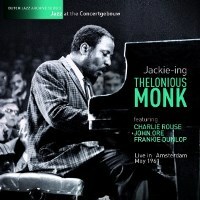 This incredible CD contains a previously unreleased concert by the Thelonious Monk Quartet, held at the Concertgebouw on May 20, 1961. Monk's debut concert in the Netherlands, held about a month earlier, has been released as bootlegs, but this encore concert was never released in any form before this CD! The working Quartet at the time featured Charlie Rouse on tenor sax, John Ore on bass and Frankie Dunlop on drums. Monk and company played seven tunes, and two of those were piano solo performances ("Body And Soul" and "Just A Gigolo") which are rare in live concerts. In addition, as bonus tracks, the CD contains six tracks taken from a TV show recorded in April. With clearer sonics, these bonus tracks let us appreciate these masters' great performances in great detail. Tracks 1-7: Recorded at Concertgebouw, Amsterdam on May 20, 1961. Tracks 8-13: Recorded at Studio Irene, Bussum, on April 15, 1961. The insert contains a full-length liner notes in English and historic photos from the concert.